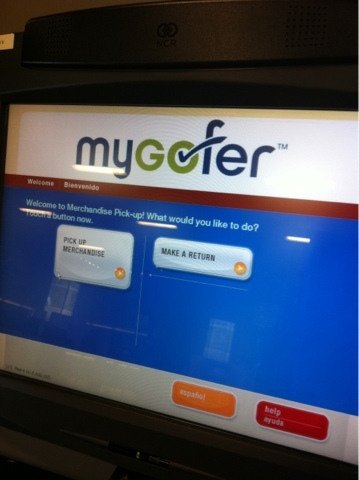 The Mom Standard: MyGofer: This Mom's Shopping Heaven! MyGofer: This Mom's Shopping Heaven! Oh, 10 years ago those words would have never been typed by my hands. Four years ago, with a newborn baby in a carrier life was still easy-peasy. Today, with a 4 year old. Yes! Getting in and out of the car is a pain in the rear when toting a toddler/preschooler. Yes, she can buckle herself in her car seat now. Yes, she can climb into the car herself. Yes, she can walk along side me in the store. Yes, it is a pain in the rear. I won't go into further details, in fear of ruining this same revelation to new moms with babies that so far are all like "I can still do what I want, when I want, and just as easy as before baby". Monday I experienced my motherly dream. A one-stop store that has a drive-thru. MyGofer. I read about the concept of the store when it was first being introduced, a Service Merchandise type model for Sears. As a marketer I just tossed this aside as a last ditch effort on Sears's part to stay treading the water. Every time I pass the only brick and mortar MyGofer in Joliet, the parking lot is empty and there are no people I see going in or out. How is Sears affording to keep this store open? 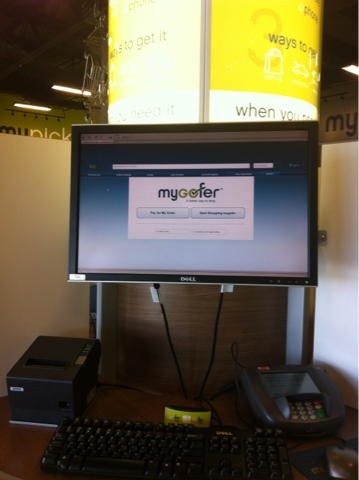 Last week I tweeted "Doe anyone shop at MyGofer?" BAM, less than 5 minutes later Jonathon replies offering to send me there to experience it myself. Well, heck yeah, sign me up! Without his reply I probably would continue to drive by the store wondering. 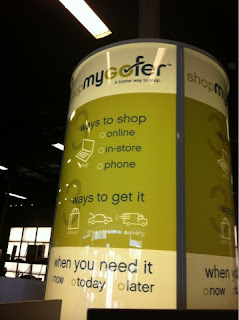 mygofer is a new way to shop that makes it easy to get the stuff you need—where, when and how you want it. Order online. Have it delivered. Pick it up at your favorite store. Whatever is most convenient for you. At mygofer, your list is our command. Shop with us for your prescriptions, groceries, beauty products, clothes, shoes, electronics and a whole lot more you might not expect. So whatever is on your list, we can help you get it—with incredible speed and no hassles. That's convenience. Speed? No Hassles? Convenience? You had me at "drive-thru". Monday morning I got online to order some basic essentials: Bleach and Vinegar. See, stuff like that I really don't want to trek the kid in and out of stores for. At first the website was a bit confusing to navigate but I got the hang of it. I received an email notification that my order was ready for pick-up so away we went. Side note: I chose to go inside this trip to see what MyGofer was really all about. Next trip, drive thru only baby! The store is set up as a showroom with computer terminals everywhere. If you didn't place your order online, you can still shop! Go to an in-store terminal, place your order, then go to the pick-up area for the order to be brought out. The majority of traffic for the business is Drive-thru. Mostly Moms who don't want to get out of the car with kids and Folks who placed orders while at work and swing by after to pick up. The drive thru gets hopping after 5pm. They have been there 4 years and each year business has increased. 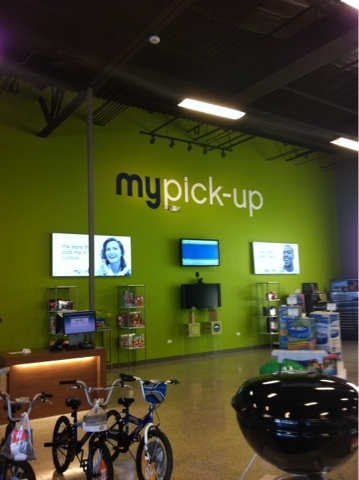 Yes, you can order a TV and groceries and pick them up through the drive-thru. Twice a day the MyGofer drivers go around to their associate stores to fulfill orders. They are a concierge business for everyone. No need to be in W.A. Buffett's tax bracket for this personal service. Really, I totally encourage you to try MyGofer.com. You'll save time, money, energy, and your sanity! *I received an e-gift from MyGofer to try the place out for myself and give it a shout-out online. All opinions are my own.